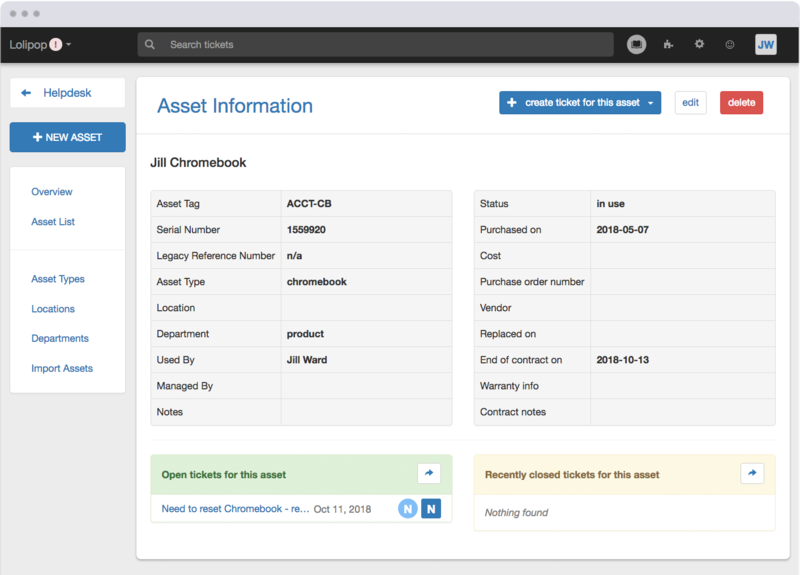 With Asset Management all of the organization’s assets can be tracked in one central location. An asset is defined as anything of value within a company such as hardware, software licenses, vehicles, contracts and even employees. By tracking assets, important data can be added and viewed such as whether the asset is in use, available or retired. Also to whom the asset is used by, the department and location it’s assigned to, as well as other details including purchase date, purchase price and warranty information. The Asset Management feature is perfect for an IT team to use in combination with the helpdesk so they can create tickets to troubleshoot device related issues or fill out request forms to check in and out devices – almost like a library system. Or a maintenance team can use it to keep track of service equipment. Another example, a transportation department could use Asset Management to manage their fleet vehicles and have automatic tickets created based on routine vehicle maintenance schedules. Once assets are added to Mojo and a user is applied to the asset, the user will then be able to choose which asset they are referring to when submitting a ticket. This makes for easier ticket resolution and tracking of issues per asset. For setting up Asset Management in Mojo please view our knowledge base articles. Or check out Asset Management highlights on Mojo Helpdesk’s website.